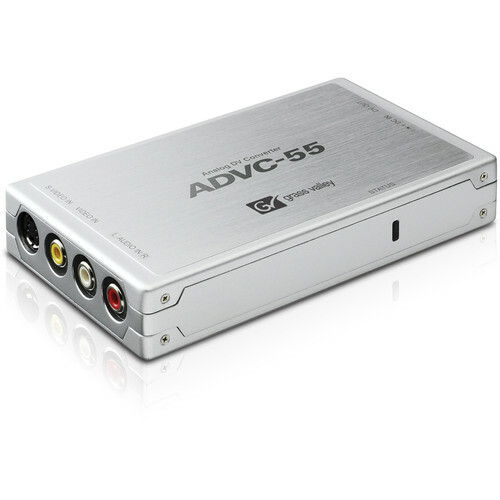 The Grass Valley ADVC55 Compact Analog / Digital Converter is a compact analog to digital video converter. It accepts composite, Y/C video and unbalanced stereo audio, converting to IEEE-1394 digital audio and video. No drivers are required to be installed and the only power supply required is the included 6-pin FireWire cable. Note: A video-capture card or OHCI FireWire (IEEE 1394) connection is required to capture DV. Connects analog video equipment to FireWire (IEEE 1394)-equipped computers for video editing. Compatible with Windows (including Windows 7) and Mac operating system-based DV editing systems. Compatible with leading editing and DVD authoring applications including Grass Valley EDIUS, Sony Vegas, Apple Final Cut Pro and iMovie, Avid Xpress DV and Liquid, Adobe Premiere Pro, Ulead MediaStudio Pro, and Windows Movie Maker. No drivers or software applications to install. Powered by FireWire (IEEE 1394a) connector. Works with many FireWire 800 (IEEE 1394b) equipped computers by means of an appropriate adapter cable (customer supplied). Box Dimensions (LxWxH) 9.134 x 6.85 x 2.992"
ADVC55 Compact Analog / Digital Converter is rated 4.5 out of 5 by 99. Rated 5 out of 5 by Nick in Houston from Great webcasting from the Mac! My daughter wanted to webcast a Wii gaming session on Ustream via our MacBook Pro. We tried four other devices, including the GrassValley ADVC mini, but none were able to act as a live feed. After a quick email exchange with Grass Valley, we determined that the ADVC55 would do the trick and it did. Setup took seconds (just plugged in the AV cables and connected the firewire to the MacBook.) No drivers or other setup necessary, it works right out of the box. iChat, iMovie, Photobooth, Ustream Producer all saw it and could use it as a live feed. Video quality was excellent, audio quality was excellent. It's small and easily portable. Rated 4 out of 5 by Anonymous from Simple & Effective Solution Used the Canopus to connect analog video connection to my laptop which uses Firewire. Worked perfectly with no loss of resolution. This is a very simple and effective solution. The only negative I can see is that even though the product writeup claims that power is not required if one uses a 6pin-6pin firewire connection, that proved to be false in the case of laptops (it worked as advertised for my desktop system). My laptop has a PC Express fireware card with a 6-pin connector which did not provide power to the device and I had to spring for the optional dc power supply. For this price the power converter should be included. Rated 5 out of 5 by Anonymous from The best Analog to Digital Video Convert I had few PAL and NTSC VHS tapes and wanted to digitize them. I tried few Video cards and USB to DVD converters. They all produced very poor quality video. Finally I decided to give this unit a try, it did produce fantastic results. The unit will convert the Analog input to DV format, which can be easily edited in any popular video editing software out there. The unit uses DV Firewire ( IEEE1394), it transfer the files in real time, much better quality than USB converts. This unit is a must for those who have old VHS, 8mm or HI8 tapes and would like to convert them to DVD. It will work or PAL or NTSC. Rated 4 out of 5 by Blue-eyed Charlie from Good for basic conversion I purchased the ADVC55 to convert old 8mm video tapes to digital...and import into iMovie on my Macbook Pro. I'm turning these into DVDs before the tape deteriorates further. There are some occasions where the digital version is a bit jerky, but it's not a show stopper. Also, my Macbook occasionally freezes while staring an import. My guess is that's a Mac issue. Perhaps a more expensive converter would get rid of these issues...but maybe not. Overall, I'm very pleased with my purchase and am confident I will get the projects completed and in pretty good shape. For the price, the ADVC55 seems good to me, and it's a piece of cake to use. Rated 4 out of 5 by Dave from Decent for the price I am a high school student who freelances and interns for a few small production companies. Although I would not use this for studio production when capturing betacam (during production), this is a great converter for someone who wants to do prosumer-quality capturing. I use this for my DVCPRO VTR which doesn't have a firewire output. The audio and video quality looked just as good as it did on the tape; I was impressed by the price. I would suggest getting this over an RCA to USB 2.0 converter; the quality is much worse and firewire is much more stable than USB. Rated 5 out of 5 by Anonymous from I like it! I turned my computer off and just plugged it to the Firewire connector in my computer. Upon powering up, it just installed the appropriate software (I didn't have to find or do anything) and used Windows Live Photo Gallery (which came with Windows 7) to get the video converted. It saved as an AVI file (huge), but then converted it to MPEG4 using another utility.So far I used it to digitize videos made with my Sony camcorder 20 years ago, connecting to the S-Video and the stereo audio output from the camera. It works like a charm. My computer has an Intel Core i7-2600 CPU @ 3.40GHz. I haven't noticed any performance issues. Rated 4 out of 5 by Loren from Performs as advertised Using the ADVC55 to digitize a raft of clinical VHS tapes. Very satisfactory tool. CAVEAT: Although the device is self-powered through the Firewire bus, professionals know that Firewire is chatty and such power is not always reliable. The optional power supply for the box really should have been included for the price- or at a competitive bundle price! There's even space for it in the product box! That seems a bit petty. Power supply was expected as it is with any hard drive and other devices B&H sells. I cannot award it a professional quality checkbox without it. It is listed for for PC/Mac. My computer doesn't have FireWire ports, will I be able to use this product? Can I hook it up to my Sony DVCAM DSR-11 Digital video cassette recorder &amp; convert my mini DV tapes to digital in Adobe Premier Elements ? Yes. However your DSR-11 has a Firewire I/O. You should be able to connect directly from the DSR-11 to your editor and control the DSR-11 from your Adobe Premier Import function. Can you confirm this is compatible with Hi8 tapes? It will take the output of your analog deck/camcorder and convert it to Firewire so you can upload them to your PC and convert the signal to digital. So far as I know if your camcorder has a yellow(video) output(or S-VHS out) and RCA audio outs you are good to go. You will however need a Firewire card on your computer. I used mine to transfer S-VHS tapes and it works flawlessly. I am looking to connect my video camera to my computer to then show LIVE VIDEO FEED on our school projectors...however, whenever I connect my camera directly to the computer it doesn't read as a video device in any of the following programs: IMOVIE, QLAB, VIRTUAL DJ. If i purchase this and connect the camera to this will it then be able to read the camera and have my just mirror what the camera is seeing during my students live performances? Again, I don't even need to record it although that would be great...just to be able to mirror their performance and zoom in and such on the projector screen behind them :) please help! I'm not sure you can use your computer as a live switcher without additional software. My suggestion is if you do not need to record or add titles, bypass the computer. The projector will take the camera feed without the need for converting the signal.